With just under 40 million people living throughout California, the Golden State’s vast number of residents and businesses quite literally create tons of documents each day—many of which contain sensitive and confidential information. The need to safely destroy documents and protect information leaves a huge number of people and companies looking for secure shredding, and to meet this demand, Shred Nations works throughout both Northern and Southern California to help connect Californians living from San Diego to Sacramento with the nearby shredding services that work best for them. Known as the “City of Angels”, the massive city of LA hosts a diverse economy stretching from entertainment to science and technology, and on top of its industries, also boasts a population of nearly 4 million people, making it the largest city in California and second most populous city in all of the United States. With its dense concentration of people, both businesses and individuals need to be sure their sensitive documents and information are always safely disposed if they want to keep them out of the wrong hands, and with the help of services from Shred Nations Los Angeles like mobile shredding, Los Angeles residents can get exactly that. Rather than leaving your home or office, one of our many local shredders in the Los Angeles metropolitan area brings a mobile shredding truck directly to your curbside to shred the documents while you watch—providing both a convenient and secure way to ensure your documents aren’t putting you at risk for identity theft or fraud. If you take a 25 mile trip down to Los Angeles County’s southernmost tip, you’ll find the city of Long Beach basking in the Southern California sun. With attractions like the Aquarium of the Pacific and the Long Beach Museum of Art, Long Beach is a major tourist destination as well as a major hub for business. A bustling city with the second busiest port and 36th largest population in all of the United States, individual city residents and major companies like Boeing find their homes in Long Beach, and when they need shredding for their sensitive personal and proprietary information, also need access to reliable document destruction services nearby. At Shred Nations Long Beach, we help to provide these services for homes and businesses with multiple pricing options and services such as mobile shredding, and even help to set up community shredding events throughout the Long Beach area so that everyone can get a chance to safely shred their documents. 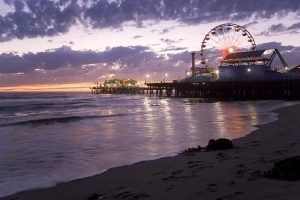 Just up the coast from Long Beach and west of Los Angeles lies the city of Santa Monica—a famed resort town and beachfront city known for the iconic Santa Monica Pier and its ideal climate. With a booming economy since the later part of the 1980s, the growing number of jobs and businesses creates a similarly increasing number of sensitive personal and proprietary documents. Despite this however, Shred Nations Santa Monica and other nearby locations help to meet the need for safely destroying confidential documents. In addition to our mobile shredding services and the community shredding events we help to set up, we also can connect Santa Monica residents and businesses with services specially equipped to handle shredding on a large-scale, such as off site shredding. Like mobile services, a truck comes to your location to pick up your documents, but instead takes them to a secure facility for shredding—helping to cut service costs by minimizing the time a mobile truck would otherwise need to shred your documents on site. Taking a scenic trip up highway 101, you can find the city of Ventura—one of the westernmost cities in the Los Angeles metropolitan area. Otherwise known by it’s official name, San Buenaventura, the city has a rich cultural history dating all the way back to the 18th century with the founding of the Mission San Buenaventura. Although a slightly smaller city and more remote from densely populated LA, Ventura’s residents and businesses can still take advantage of shredding services like mobile and off site services for destroying their paper—however sometimes distance must be a cost consideration. The farther trucks travel, the more a shredding project can cost, which is why there are also cost-efficient alternatives like Shred Nations’ drop off shredding locations scattered throughout Ventura and California. Found in local UPS and other shipping stores, all it takes to have paper shredded is walking in to drop off documents, rather than scheduling a service. Several hundred miles to the north, the city of San Francisco is also a major population center and considered to be the cultural, commercial, and financial center of Northern California. Having nearly 18,500 people per square mile, the city is one of the most densely populated cities in the country, and on top of its population is also the headquarters of technology companies ranging from Twitter to Yelp. With a growing technology-based economy, San Francisco homes and businesses can also utilize electronic media shredding and hard drive destruction services when they need to safely dispose electronics in addition to their hard-copy document shredding. Your digital media and devices such as CDs, DVDs, fax machines, scanners, and hard drives contain the same personally identifiable information as sensitive paper documents, but with electronic media shredding services you’re able to get absolute destruction for these additional risks. Besides major hubs like Los Angeles and San Francisco, Shred Nations has locations all throughout Northern and Southern California’s cities as well as the greater United States. With each location able to offer you the full range of shredding services including mobile, off site, drop off, and electronic media destruction through our nationwide network of providers, Shred Nations strives to meet the shredding needs for every Californian’s schedule, budget, and project requirements. For more information on any of our available services or to begin comparing competitive bids from local shredding providers in your city and area, simply give us a call at (800) 747-3365, or just fill out the form at the right of your screen for free quotes on your shredding project today!